Here are 5 tips to help you celebrate the spirit of National Nutrition Month! Eat Breakfast – always start your day with a healthy meal. Include lean protein, whole grains, fruits and vegetables. Make half your plate fruits and vegetables – add flavor, color and texture and plenty of nutrition with fruits & veggies. Watch portion sizes – use smaller plates, bowls and glasses can help you keep portions under control. Use half your plate for fruits and vegetables and the other half for grains and meat. Fix Healthy Snacks – healthy snacks can help you sustain energy between meals. Try low-fat yogurt with fruit, whole-grain crackers with cheese, or small portion of nuts with an apple or banana. Get Cooking – cooking at home can be healthy, rewarding, and cost-effective. Resolve to learn some cooking and kitchen basics, like to dice an onion or how to cook with more herbs and spices. Called tortilla Española throughout Spain, this traditional dish often is called a potato-onion omelet. Not to be mistaken with Mexican tortillas — made with corn or wheat — in Spanish cuisine, a tortilla is made of sliced potatoes and onion, pan-fried in olive oil in a skillet, then layered with beaten eggs, and oven-baked until the eggs are cooked until firm. 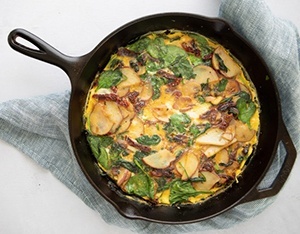 This variation uses less olive oil and adds tomatoes and spinach, making it a nourishing entrée for a light supper or brunch. Heat the olive oil in an oven-proof non-stick skillet over medium heat. Add the potatoes, onion and garlic; combine to coat the mixture with olive oil. Cook for about 10 minutes, stirring frequently to prevent sticking until the potatoes are tender, yet still firm. (Add more oil if needed.) Remove from the heat. Mix the sun-dried tomatoes, rosemary, thyme and paprika into the potato-onion mixture in the skillet. Fold in the spinach. Separately, lightly whisk the eggs, egg whites, salt and pepper in a medium bowl. Pour the eggs over the spinach-potato-onion mixture. Return to the heat. As the eggs cook, shake the skillet so the egg mixture flows to the other ingredients. Use a spatula to gently raise the edges of the tortilla so the uncooked eggs flow underneath. As the edges of the tortilla begin to set, remove put the skillet from the stove top and place it under the oven broiler. Broil for about 5 minutes, or until the top becomes golden brown and the eggs are set. Remove from the broiler with a hot pad; cool slightly so you can handle the skillet. Slide the spatula around the edges and underneath the tortilla. Gently slide the tortilla from skillet onto a serving plate. Allow to cool for about 5 minutes before serving. Cut in wedges. Serve hot or at room temperature. Garnish with parsley. *If you prefer, substitute roasted red peppers for sun-dried tomatoes. **Egg whites are used to reduce the cholesterol. Substitute 2 large eggs for 4 large egg whites if desired. Recipe source: Roberta Duyff, MS, RD, FAND, is author of Academy of Nutrition and Dietetics Complete Food and Nutrition Guide and 365 Days of Healthy Eating.